This month marks the 25th anniversary of U.S. Senate ratification of the Genocide Convention. On February 19, 1986, the Senate gave its advice and consent to ratify the International Convention on the Prevention and Punishment of the Crime of Genocide, 38 years after the convention was adopted by the UN General Assembly and 35 years after it officially entered into force. It took another two years for Congress to pass implementing legislation, known as the Proxmire Act, and deposit its ratification with the UN. The Senate Champion: It also took determined congressional leadership to ensure full U.S. ratification of the treaty. 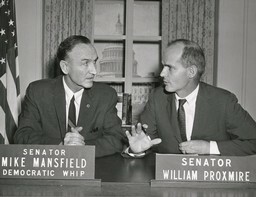 Senator William Proxmire (WI) vowed in 1967 to deliver a speech on the Senate floor every day until the Genocide Convention was ratified, and he kept his promise. He delivered a total of 3,211 speeches over the 19 years until final passage of the Proxmire Act, named for him. On February 18, the day the Senate finally took up the convention for a successful ratification vote the next day, Senator Proxmire explained his conviction, stating that “the U.S. Senate also has a historic opportunity to affirm human dignity and bear witness to the millions of people that died in the Holocaust by ratifying the Genocide Convention. This treaty not only recalls the tragedies perpetrated against victims of genocide such as the Jews in World War II and the Armenians in the early 20th century Turkey, but also seeks to prevent future holocausts by outlawing genocide as an international crime which each signatory undertakes to prevent” (emphasis added). The Debate: Senator Richard Lugar (IN), chairman of the Senate Foreign Relations Committee, also elaborated on that day the advantages of signing the treaty, including “symboliz[ing] our commitment to law and our profound respect as a nation for human rights”. Several senators who voted against ratification registered their objections to the convention on the Senate floor as well. Senator Jesse Helms (NC) noted that “my chief objective with regard to the Genocide Convention has been to see that the independent sovereignty of the United States is protected from interference by an international regime of law.” On February 19, Senator Steven Symms (ID) offered an amendment, eventually voted down, that would have added “political groups” to the list of groups covered by the treaty. Senator Martin Wallop (WY) also registered his concern that the convention could be turned against Israel, saying that “many instruments of the UN system have become wily, sinister weapons in the hands of the world community.” Despite such objections of the time, the Senate voted overwhelmingly to ratify the convention (83 to 11, with 6 abstentions), a benchmark moment in the history of the U.S. Congress to helping prevent genocide. Where Are We Now? Twenty-five years after the U.S. Senate voted to ratify the Genocide Convention, the U.S. is still not well-equipped to carry out its treaty commitment of helping prevent genocide. Since the convention was created, the world has stood largely paralyzed as mass slaughter of civilians unfolded in Cambodia, Rwanda, Srebenica, and Darfur. In 2008, the bipartisan Genocide Prevention Task Force, chaired by former Secretary of State Madeleine Albright and former Secretary of Defense William Cohen, issued a report highlighting the gaps in U.S. capacities to help prevent genocide and mass atrocities and offering specific recommendations for generating better leadership, policy, strategies, and tools for atrocity prevention. The Obama administration and Congress have taken some steps toward implementing these recommendations, including Senate passage in December 2010 of a resolution (S. Con. Res. 71) calling for specific steps to improve U.S. capacities to prevent genocide and atrocities. However, significant more work needs to be done. The 112th Congress has yet to outline a human rights agenda, and no Proxmire-like leadership has yet stepped forward to champion the critical next legislative steps on genocide prevention. Fortunately, a new genocide prevention movement of human rights, humanitarian, religious, student, and other groups is emerging and advocating concrete policy proposals to help make never again, finally, a reality. The U. S. is not only ill prepared to prevent genocide, but is also a major contributor to death and destruction. The U. S. continues to produce cluster bombs and land mines that kill long after conflicts are over. We invaded and terrorized Iraq illegally. We currently, as a matter of policy, lock people up indefinitedly without charges and practice extraordinary rendition. I should think the first step is to correct the tendency for the U. S. to terrorize other populations. At the moment, Muslims are a particular target. The better the US is able to act to prevent genocide, I’m afraid, the less willing it will be to consider any given conflict as a genocide. With respect to the killing in Darfur – the international community, including the US, did not want to identify it as a “genocide” because to do so would trigger obligations to act. One thing which is needed is an independent entity with the power and without any disincentive to declare that a “genocide” exists.